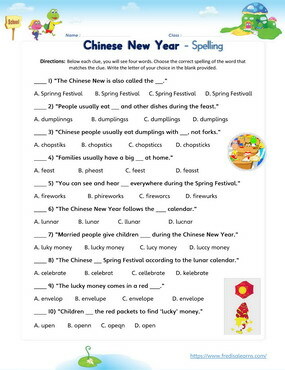 This English lesson teaches students words and expressions related to Chinese New Year celebrations. The lesson also teaches a number of verb/noun collocations used when talking about festivals. 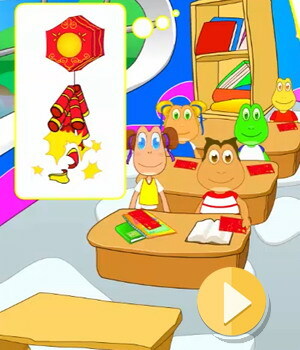 It teaches ESL kids the use of tag questions to confirm information. The worksheets below are useful for offline and classroom activities. 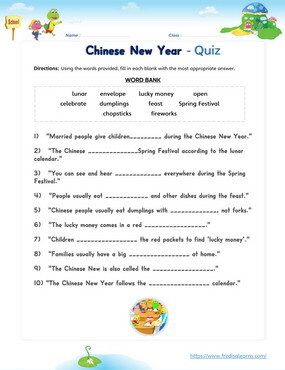 These printable exercises directly correlate with the above lesson 'Chinese New Year'. Every worksheet comes with an answer sheet on the second page for educators. At Freddie’s school, teaching children about different cultures is important. 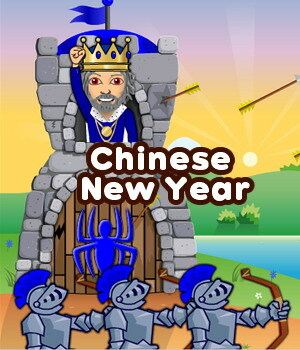 Today the lesson focuses on the Chinese New Year or Spring Festival. 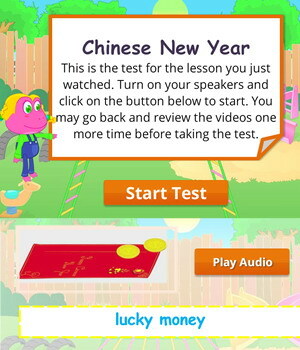 Ms. Ann teaches students how the Chinese New Year is celebrated and offers lucky money in red packets to the students. Freddie is delighted. The Chinese celebrate Spring Festival according to the lunar calendar. Children do not go to school during the Spring Festival. Married people give lucky money to children. Families usually have a feast. Chinese people eat dumplings with chopsticks. Children open the red envelope to find lucky money. There is a parade during the Chinese New Year. There is a show during the Chinese New Year. There are fireworks during the Chinese New Year. There are feasts in different homes.